Mr. Skele­ton also had a brief stopover in Giza, but we can’t show it due to pend­ing legal action. I bet he’s going to do a nifty leg-​scissor to cheat or some­thing like that. There’s just so much EVIL in his eyes! No tuba toot­ing. 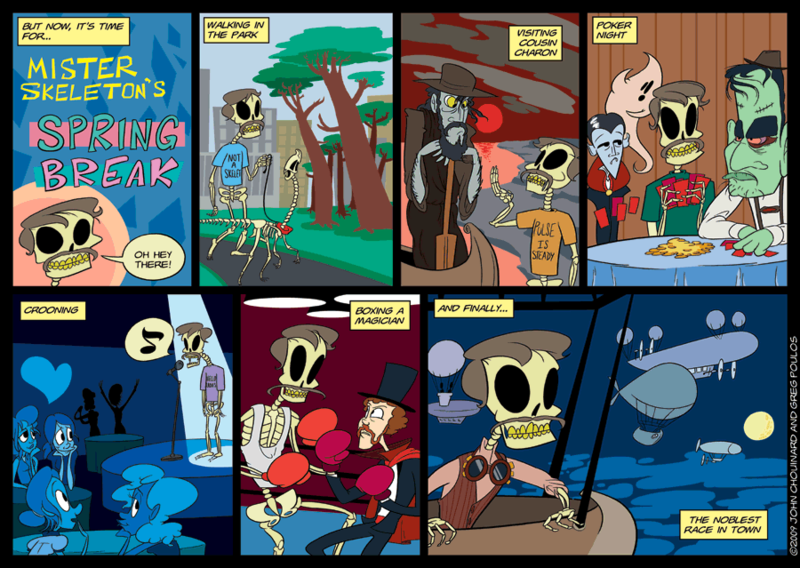 Mr. Skele­ton doesn’t quite have the lung power to pull it off. And even if the magi­cian cheats, I still think it would be pretty tough to drop Mr. Skele­ton. Then again, if anyone can do it, it’d be a magi­cian, wouldn’t it? Is his pet an Ovi­rap­tor? And what does it say on the shirt he wears while croon­ing? I totally LOVE the T-shirt which says “Pulse is steady”. I agree Air­ship racing IS the most noble race. @Greg Unless the magi­cian can turn Undead.